I love picking up whole roasting chickens when they're on sale. I always look at whole roasting chickens as a "Two for One" deal because after roasting the chicken and using the meat in various ways, I'm left with the trimmings, bones, skins, etc which I save and freeze to make homemade chicken stock later. Today I roasted a chicken stuffed with whole garlic cloves and rubbed with a garlic and onion seasoning. Once roasted, I removed the chicken meat to use for tacos. Pat your chicken dry and set aside. Peel the head of garlic and separate the whole cloves. Peel off papery skins and place the cloves into the cavity of your chicken. Place your garlic filled chicken into a roasting pan and drizzle the oil over the chicken. Rub the oil all over the chicken as it will help it get a nice golden color while baking. Liberally rub the seasoning over the chicken until well coated. Bake the chicken in the preheated oven for 1 hour uncovered. Remove the chicken from the oven and allow to cool; once cooled, remove the chicken from the bones and set aside. Place the bones, scraps and trimmings in a freezer bag and freeze to make a homemade chicken stock later. Use the chicken meat as the filling for your tacos and place inside warm tortillas with your preferred condiments and extras. 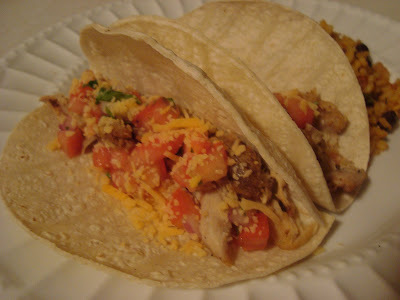 I love having leftover chicken for tacos, sandwiches, quesadillas, salads... it's great for so many dishes! These look AWESOME, Joelen! YUM!! These look delicious! I love buying whole chickens too. It's amazing how much use you can get out of it!